The countdown has started for the April 1 inland trout and salmon opener, still considered a revered day by many anglers. If you can’t wait until the opener, there are plenty of Great Lakes streams from which to choose. There have been some good reports of trout in the tributaries off Lake Erie. Scott Feltrinelli with Ontario Fly Outfitters updates that he had to work for them over the weekend after a productive Friday. Water temperatures were cold, but the water quality was perfect. 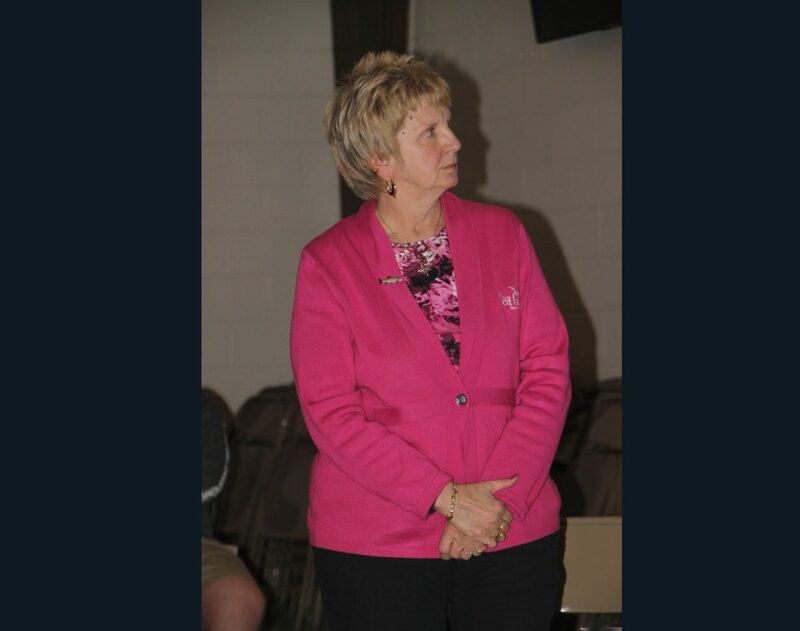 Feltrinelli felt overall numbers seemed to be down and that it could be impacted by ice jams at the creek mouths. Fish were down and sluggish from the cold water. Water was high and lightly stained his last trip out. All in all, it was the best spring water he’s seen in a long while. He caught three steelhead on the fly in three hours. The State of Lake Erie meeting is April 11 at the Southtowns Walleye Association’s clubhouse, located at 5895 Southwestern Blvd., Hamburg, starting at 7 p.m. Some great information on the lake, streams, barotrauma with fish and more will be available. There are plenty of fish available. However, the river water is super clear, and fish are getting really picky, according to Capt. John DeLorenzo of Niagara Falls. “Your presentation must be perfect, or you won't get the bites. Long leaders with 6-pound test fluorocarbon fishing line is a must. Downsize your baits with small egg sacs about the size of a pea in pink or yellow. 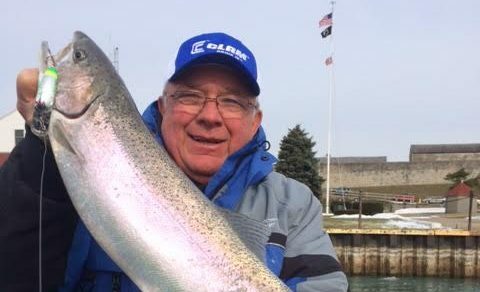 Chartreuse micro yarn flies have been working for DeLorenzo and over the weekend produced a 16-pound steelhead for George Peterson of North Tonawanda. Check it out in the Catches of the Week. Some nice brown trout are being caught and there are some lake trout around. If you catch a walleye, remember that they are out of season. Minnows and shiners have been good baits to use, again off three-way rigs. The gin-clear water has impacted shore fishing in the gorge, too. Spinners and jigs have been working for Ricardo Davila of Wheatfield, but he had to work for them. The NYPA fishing platform should open at sunrise on April 1 without any weather surprises. The reservoir and the water intakes area along the upper river also open April 1. The tributary action is starting to pick up and fresh fish are in the streams. With rain in the forecast going into the weekend, it could help trigger a few more trout. Feltrinelli reports he’s had good success with white and black woolly buggers. Stripped, jigged or twitched, the browns and steelhead crushed them. These fish are hungry, Feltrinelli said. Bags and beads are working for some anglers. Some smaller creeks also had some fish in them. Don’t rule out casting off the mouth of creeks with spoons or spinners into the lake either. Roy Letcher of Olcott reports shoreline trolling and pier action are starting up. Spoons and spinners are starting to work off the piers. Trolling the shoreline shallows from 6 to 18 feet of water with small stickbaits or spoons is a good approach, seeking temperature breaks as small as 1 degree, such as out of a creek. Look for any kind of stained water, too, and work the edges. Letcher was bouncing bottom with a swimbait on the Niagara Bar over the weekend and managed to haul in a 41-inch lake trout. Check it out in this week’s Catches gallery. Daylight saving time means extended fishing time for many avid Lake Simcoe ice perch anglers, according to Wil Wegman. That’s what they’ve been chasing since lake trout, whitefish, Cisco and walleye closed. There is still 2 feet of decent ice left, which means great late season conditions. If only the traditional late season locations were as turned on as they normally are this time of year when we still have ice, it would be amazing. Such is not the case. Many anglers are wondering where all the perch are. “Naturally some still find the jumbos but they’re working hard for them,” Wegman said. Drill lots of holes, do lots of searching between shallow and deep water. During this transition period, when cool weather meaning no rivers fully open yet and minimal runoff, perch are found deep and shallow. That will change soon as spring is in the air and open water season is not far away. Patience. Mike Sperry at Chautauqua Reel Outdoors reports that not much is going on. Ice fishing is over. Guys are fishing the canals for crappie but are finding only perch so far. We could use a little warmer temperatures and rain to really get things going. Some water was opening off Lakewood Rod and Gun in the lower end, and some crappies were being caught. It could be a good weekend there.